Trans1-T1 Phage Resistant Chemically Competent cells are specifically designed for chemical transformation of DNA. They are the fastest growing chemically competent cells currently available, offering a doubling time of approximately 50 minutes. Trans1-T1 colonies are visible within 8 hours of plating, enabling you to plate and pick colonies the same day. Perform minipreps after only 4-8 hours of growth from an overnight colony – These cells can save you an entire day of work! Minimal non-specific recombination in your cloned DNA plasmid (recA-). 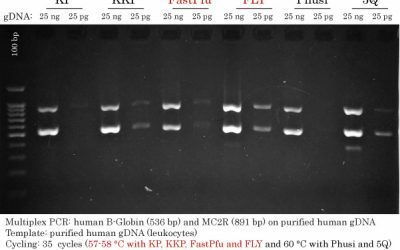 Clean preparations of DNA and better results due to the elimination of Endonuclease I (endA1). Fast-growth, colonies are visible in 8~9 hours. Resistance to T1 and T5 phage (tonA). Efficient transformation of unmethylated DNA from PCR amplifications. 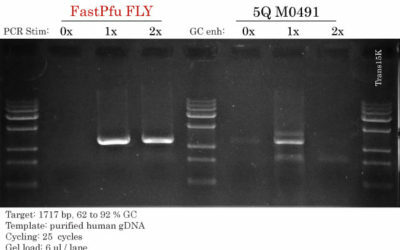 High transformation efficiency: > 10ˆ9 cfu/μg (pUC19 DNA). 1- % de clones positifs le plus élevé. Tried this strain as an alternative for DH10B. Worked beautifully with large plasmids, and saw colonies 12-14hrs of plating. I was curious to see if this strain actually grew faster so I picked colonies from a plate and grew them overnight. 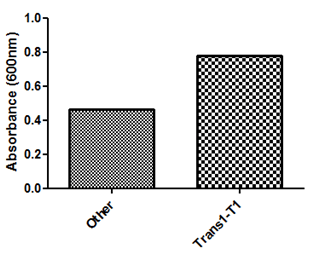 The subsequent day, the Trans1-T1 culture had a higher absorbance than the competitor strain.